Global temperatures have begun to retreat from their El Niño-fueled peak earlier in the year, but the excess heat trapped by greenhouse gases is keeping them well above average and 2016 is likely to become the hottest year on record. The running average of global temperatures throughout 2016 compared to recent years. Each month shows the average of that month's temperature and each month before it. La Niña could continue to cool global temperatures through the last two months of the year, bringing the year-to-date temperature closer to 2015. 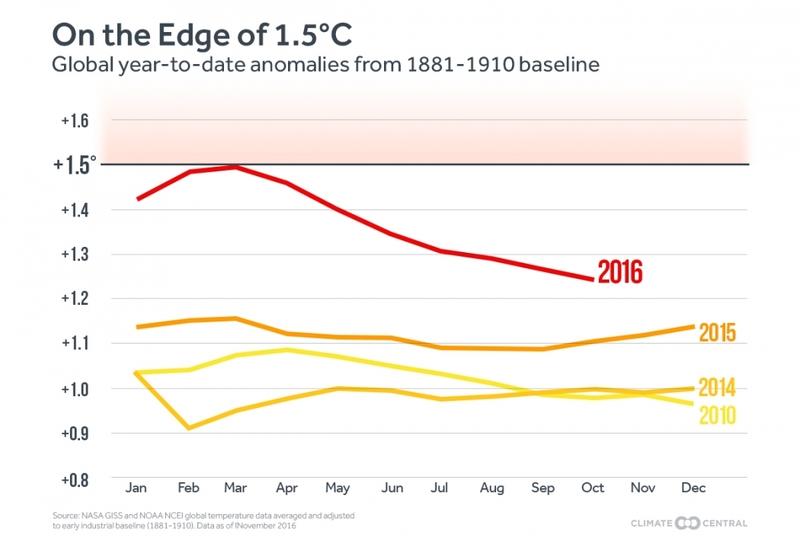 But no matter the final yearly rankings, 2014, 2015 and 2016 will be the three hottest years on record, Blunden said. Their chart-topping temperatures are mainly due to the excess heat trapped over decades by ever-rising levels of carbon dioxide and other greenhouse gases in the atmosphere. In NOAA’s records, the 15 most abnormally warm months have happened since March 2015, including every month of 2016 through September (one exception was January 2007, which tied for 11th place). Governments agreed last year in the landmark Paris accord to limit the amount of warming this century to “well below” 2°C (3.6°F) from preindustrial times to curb the impacts of that warming. These impacts include rising sea levels, melting polar ice, disturbances to ecosystems and more instances of extreme weather. The hope is to actually limit warming even further, to no more than 1.5°C above preindustrial temperatures by 2100. How temperatures around the world compared to normal for the year so far. To show how close the world already is to reaching that limit, Climate Central has been reanalyzing the global temperature data each month, averaging together the NASA and NOAA numbers and comparing them to the average from 1881-1910, a time period closer to preindustrial times. 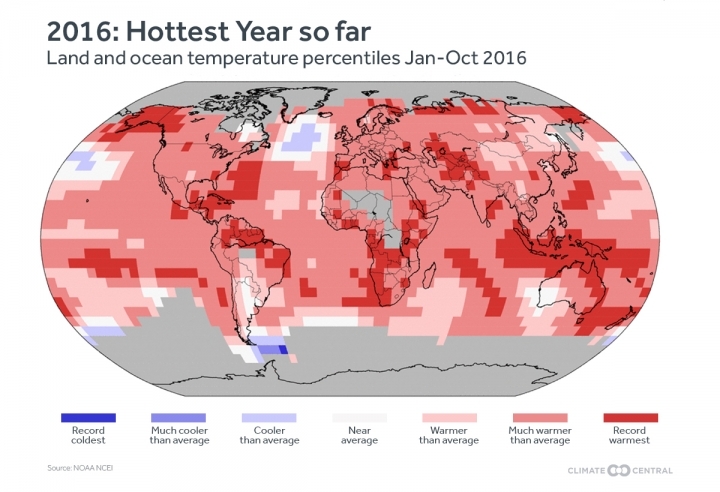 Through October, 2016 is 1.24°C above the average from that period. Climate scientists and international negotiators are concerned that the election of Donald Trump, who has pledged to pull the U.S. out of the Paris agreement and dismantle domestic climate policies, will derail the efforts to limit warming. At the U.N. meeting on implementing the Paris compact taking place in Morocco, the World Meteorological Organization told delegates that 2016 would very likely be the hottest year on record and that the five-year period from 2011 to 2015 was the hottest such period on record.